The Food and Drug Administration last week cleared the way for genetically engineered salmon to be sold in the U.S. The agency on Friday deactivated a 2016 import alert on such salmon, FDA commissioner Scott Gottlieb said in a statement. That ban restricted the sale of genetically engineered salmon in the U.S. until the agency issued labeling guidelines. The change has alarmed some in Alaska about what genetically engineered salmon on the market might mean for Alaska’s salmon industry, which harvests wild fish. Alaska Sen. Lisa Murkowski, a Republican, pushed back in December 2015 against the market introduction of genetically engineered salmon and called for stricter labeling requirements on such products. The import ban was put in place the following month. The Alaska Seafood Marketing Institute supports Murkowski’s position, said Jeremy Woodrow, the institute’s communications director. The group’s research shows that consumers “want to know where their seafood comes from,” he said. It’s not yet clear what genetically engineered salmon could mean for Alaska. The way that such products may affect pricing for Alaska salmon has yet to be seen, Woodrow said. In 2015, the FDA approved an application related to genetically engineered salmon from a Massachusetts company called AquaBounty Technologies. But the import alert prevented the company’s products from entering the U.S. 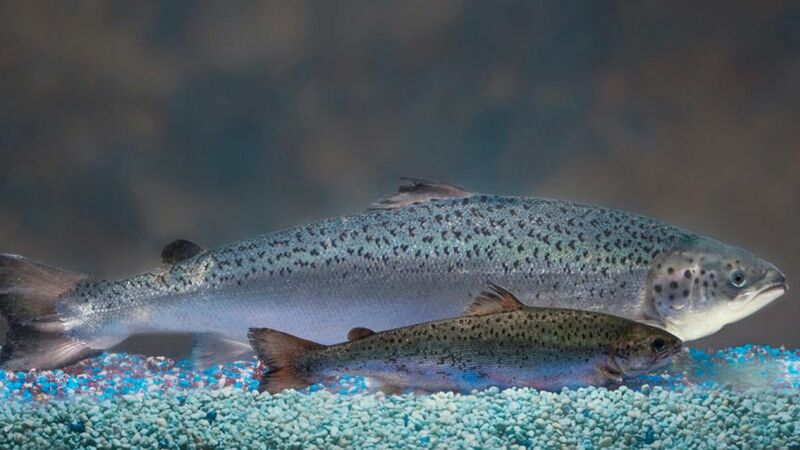 Lifting the ban means the company’s AquAdvantage salmon eggs “can now be imported to the company’s contained grow-out facility in Indiana to be raised into salmon for food,” the FDA said. The company has a facility in the province of Prince Edward Island in eastern Canada, where the salmon eggs are produced, according to the FDA. AquaBounty’s technology integrates a chinook salmon growth hormone gene into the genome of Atlantic salmon, resulting in a fish that grows faster than a standard Atlantic salmon, according to the company’s website. The FDA determined in a 2015 review that the fish is safe to eat. With its technology, AquaBounty wants to “spur a radically more responsible and sustainable way of farming Atlantic salmon,” its website says. The product is already sold in Canada. The United Fishermen of Alaska referred to the genetically engineered salmon as “frankenfish” in a statement Friday. The group said the FDA lifting the ban without requiring clear labeling for the product is a “disservice” to consumers and a blow to the state’s fishing communities. It’s not clear when genetically engineered salmon might hit the market, said Woodrow. A phone call and email to AquaBounty were not returned Monday. Instead of mandatory labeling for genetically engineered salmon, Murkowski’s office said, producers will be allowed to use QR codes or 1-800 numbers that would refer customers to more information. Another one of Murkowski’s concerns, Borger said, is about a man-made fish that could outgrow natural stocks. The senator has introduced legislation over the years to mandate the labeling of genetically engineered salmon. Frances Leach, executive director of United Fishermen of Alaska, is concerned that genetically engineered salmon on the market could potentially mean consumers will buy less Alaska salmon. “The consumer ... is going to see wild Alaska salmon and this other salmon that they don’t know what it is. They just know it’s salmon, and likely it’s going to be cheaper because they can create these GMO salmon for cheaper than we go out and fish for salmon,” she said. ASMI won’t be specifically targeting marketing efforts against genetically engineered salmon, Woodrow said. ASMI sees it as another farmed product to which wild-caught Alaska salmon is superior. “In the retail space or food service space, it’s another farmed salmon product, and we’ll be competing against this product like we have with other farmed salmon,” he said.